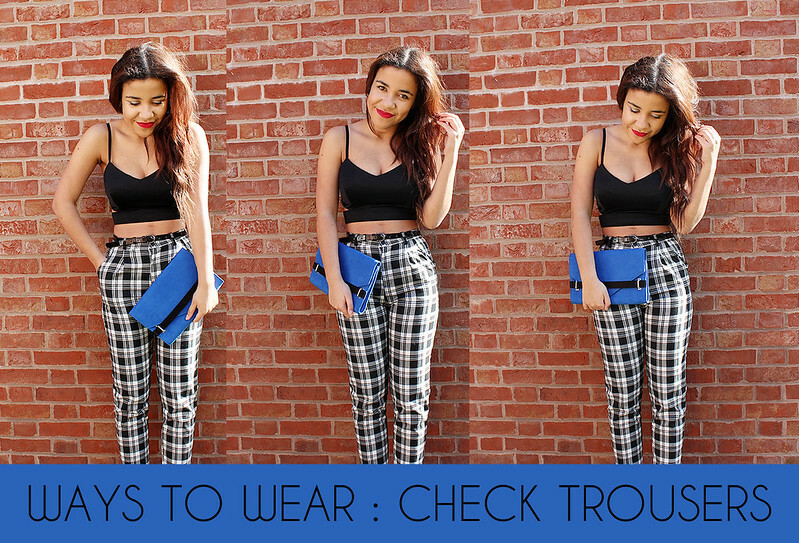 Over the past few months I've developed a real trouser obsession! I absolutely love a pair of patterned trousers and after seeing these on Missguided a few months ago I knew I had to have them! These trousers recently came back in the back in stock section and I had to snap them up! The material of these trousers is quite thick (in comparison to other Missguided trousers) and they have darts at the top and pockets too! I like how they can be dressed up and dressed down. I've teamed these trousers with my favourite bralet top from Missguided which is sold out but they have a cheaper £10 black bralet in stock here! I love this outfit combination and topped off with my Ruby Woo by Mac Lipstick and my bright blue next clutch bag this is the perfect going out outfit! I absolutely adore this outfit and can't wait to wear it on an night-out! I think it's simple but classy and you'll stand out from the crowd as the trousers are such a gorgeous pattern! you look incredible. I love those checked trousers. You look wonderful! such a pretty outfit! Amazing photos! I'm delighted with your blog :) I wish you good luck! Love this outfit, those trousers are amazing!